In both case, please pay attention to the validity period and terms of the coupon. This type of coupon is available both through JD CENTRAL’s websites at www.jd.co.th and www.m.jd.co.th, and through our IOS and Android apps. If the coupon is a Platform-Specific J Coupon, multiple coupons can be used for the same order, or can be used together with Category-Specific J Coupons and Store-Specific J Coupons. A J Coupon can be used to reduce the order amount by its face value, but cannot be used together with a D Coupon, nor can it be applied to special products. If the value of an All-Category J Coupon exceeds the order amount, the difference will not be returned to the user. For example, should a customer place an order worth 89 ฿ and then use a J Coupon worth 100 ฿ to pay for it, the difference of 11 ฿ would not be returned. This type of coupon is available both through JD CENTRAL’s websites at www.jd.co.th and www.m.jd.co.th, and through our IOS and Android apps. It differs from a J Coupon in that it can only be applied to orders above a certain size. When the total order amount meets the minimum spend limit specified, the order amount will be reduced by the face value of the coupon. For example, a D coupon with a face value of 100 ฿ and a minimum spend limit of 2000 ฿ can only be used on an order worth 2000 ฿ or more, for a discount of 100 ฿. D Coupons are also not applicable to special products. 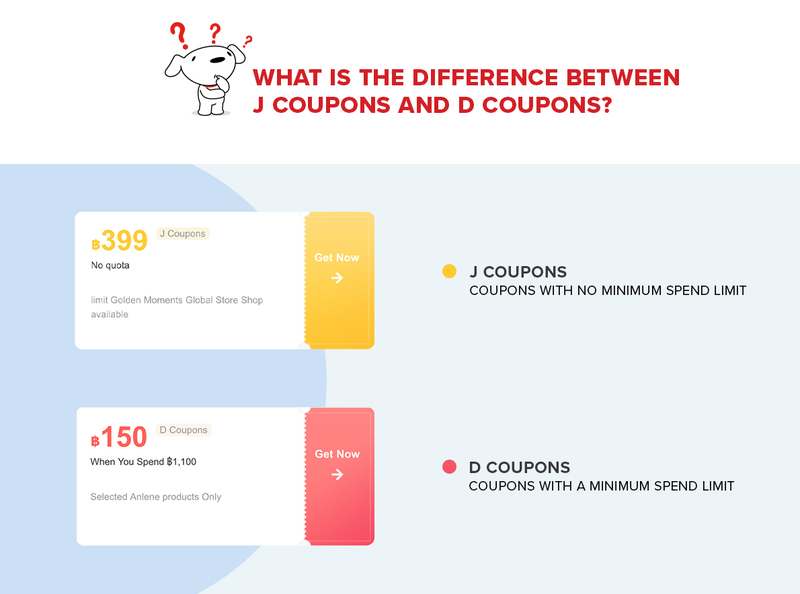 An All-Category D Coupon cannot be used in conjunction with a J Coupon, as mentioned above. 1. An order contains items A, B and C. A user has a J Coupon worth 10 ฿ and a J Coupon worth 15 ฿, both applicable to A. In this case, both J Coupons can be used together for this order. 2. An order contains items A, B and C. A user has a J Coupon worth 5 ฿ applicable to A and a J Coupon worth 15 ฿ applicable to B. In this case, both J Coupons can be used together for this order. 3. An order contains items A, B and C. A user has a J Coupon worth 5 ฿ applicable to A and B and a J Coupon worth 5 ฿ applicable to B and C. In this case, it is not possible to use both J Coupons for this order. 1. An order contains items A, B, and C. A user has a D Coupon worth 10 ฿ with a minimum spend limit of 200 ฿ applicable to A and a J Coupon worth 5 ฿ with a minimum spend limit of 300 ฿ applicable to B and C. If A still costs more than 200 ฿ after the discount from the first coupon has been applied, and B and C still cost more than 300 ฿ after the discount from the second coupon has been applied, then both coupons can be used on this order. This is a J Coupon which can only be used on items from a specific store on JD CENTRAL. Please note that all of the items in the order must be sold by the store in question otherwise the coupon cannot be used. For example, if a customer wants to use a Store-Specific J Coupon for Jack Jones worth 50 ฿, all the items in their order must be from this store. Multiple Store-Specific J Coupons and All-Category J Coupons can only be used together if they cover either exactly the same set of items within an order, or if they cover completely different sets. Store-Specific J Coupons cannot be used together with D Coupons. This is a D Coupon which can only be used on items from a specific store on JD CENTRAL. 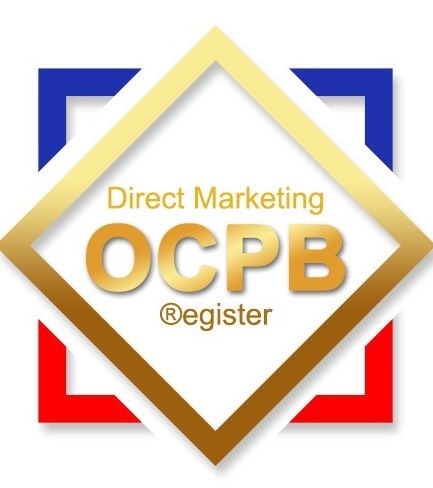 If a customer wants to use more than one D Coupon at the same time, they must first ensure that the items and stores covered by the respective coupons are completely different. In addition, the order amount still has to be above the minimum spend limit even after the discount from each coupon has been applied. For example, to use a Store-Specific D Coupon for Jack Jones worth 100 ฿ with a minimum spend limit of 2000 ฿, all items in the order must be sold by Jack Jones, and the total order amount must be 2000 ฿ or above.